At the end of a "textbook" spacewalk, astronauts Stephen Bowen and Alvin Drew paused before returning to the International Space Station's Quest airlock module so Drew could open a valve and "fill" a small container with the vacuum of space as part of a Japanese educational initiative. After their crewmates played a recording of "Message in a Bottle" by the Police, Bowen grabbed a camera and with the Japanese Kibo laboratory module behind him, Drew opened the bottle to space while Bowen snapped pictures. The astronauts then returned to the Quest airlock, closed the hatch, hooked their suits to ship power and repressurized the compartment to officially end a six-hour 34-minute spacewalk. 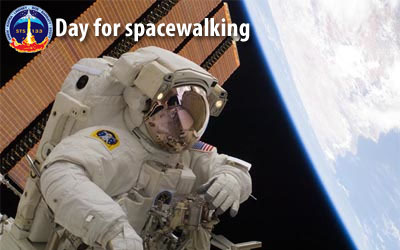 The spacewalk began at 10:46 a.m. EST (GMT-5) and ended at 5:20 p.m. This was the 154th spacewalk devoted to space station assembly and maintenance since construction began in 1998, pushing total EVA time to 967 hours and 39 minutes. It was the first spacewalk for Drew and the sixth for Bowen, pushing his total to 41 hours and four minutes and moving him into the top 20 on the list of most experienced spacewalkers. The astronauts successfully installed a backup power cable for the Tranquility module, stowed a failed ammonia coolant system pump and carried out a variety of maintenance tasks ranging from insulation repairs to installation of a wedge to provide needed clearance between an external television camera and a storage platform. "You guys did an excellent job today, you rocked," spacewalk coordinator Nicole Stott radioed from inside the shuttle-station complex. Timothy Kopra, who was replaced by Bowen after he was injured in a bicycle accident in Houston last month, passed along his congratulations as well. "To the whole team, great work completing a textbook EVA," he said. "And Al, congratulations for a stellar job on your first spacewalk. Good job, dude." "Thanks, Tim, couldn't have one it without you," replied Drew, the 200th person to walk in space.